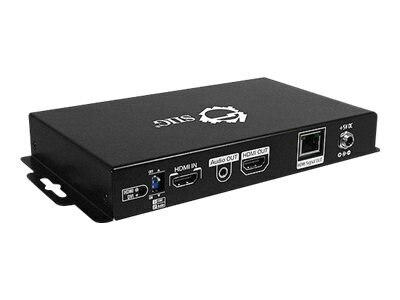 SIIG's HDMI over CAT5e Transmitter with HDMI Loop-Out enables you to extend HDMI signals from an HDMI source device such as DVD player, Blu-ray Disc player, game console, PC, and many more to an HDMI receiver or transceiver at a remote location. It transmits high definition video and high quality audio over an economical CAT5e/6 cable at a great distance. This transmitter also provides an HDMI local display output for monitoring function to ensure High-Definition digital signals are transmitted in different locations. It is wall-mount ready for easy integration, helping to enhance and improve the capabilities of your digital signage system.